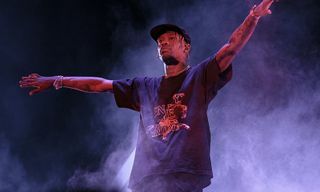 The partnership between Jordan Brand and Travis Scott really seems to be taking off. 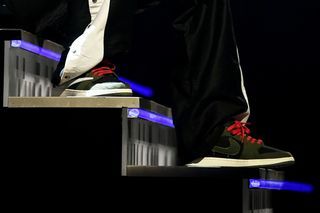 Not only did the rapper’s hotly anticipated reverse-Swoosh Air Jordan 1 collaboration surprise-drop on Nike SNKRS during his Grammys performance, Scott also showcased yet another collaborative sneaker during the performance itself. 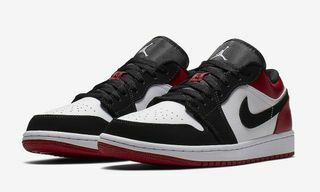 The sneaker was an Air Jordan 1 Low with an olive and black upper, contrasting bright red laces, a distressed canvas Swoosh on the medial side, and a white reversed Swoosh on the lateral side. 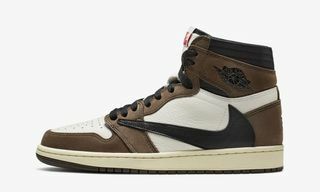 Scott had previously teased an Air Jordan 1 Low in early December 2018, although that one featured brown overlays instead of olive. 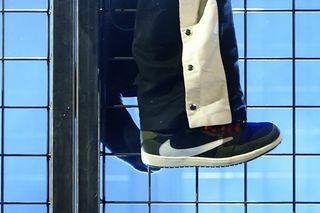 No official announcement has been made regarding this latest Air Jordan 1 Low, so it remains to be seen whether the sneaker will actually drop or is just a one-off to be worn on stage at the Grammys. 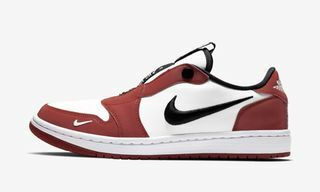 In addition to the Air Jordan 1 that dropped during the show and is expected to get a wider release in April, Scott also has a Jordan 33 collaboration set to drop soon. 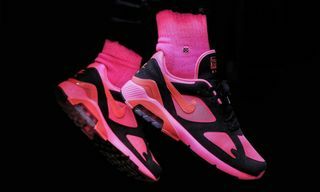 As for the low-tops, stay tuned for updates.